Black centre, Black leather, Black stitching in extremely good shape, one slight scratch on the front as shown in the picture. Note that this is accentuated by the flash on the camera. These wheels are not made any more so the only ones you can find are second hand on Ebay or Yahoo Japan. This wheel is not new but is pretty much as close as you can get. 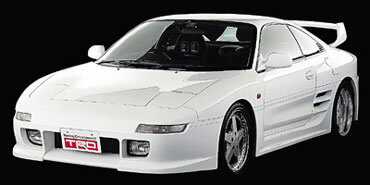 I bought it from DB8 who is a well known and well respected MR2 specialist parts supplier. Reason for sale: I bought the TRD steering wheel to use for car shows but only used it once two years ago as I have a different wheel for day to day driving. I am not really using the wheel and as it is such a rare and unique piece I would rather see it go on to be used by a fellow MR2 enthusiast where it can be appreciated. I am told it fits all MK2 MR2's (airbag or not) it fitted ok on my 1992 GTS (non airbag) however is really designed for airbag equipped MR2's. TRD is arguably the best aftermarket parts for Toyota cars as they are designed in conjunction with Toyota engineers to be a direct and easy performance uprade. Payment strictly by paypal and goods transfered when funds cleared.